Make Something You’ll Love to Wear At Fashion in Harmony, we have a bias for bias cut garments. We love how just the simple act of turning the fabric on the bias results in a dress, jacket, skirt, blouse, or other garment that is comfortable and flattering to wear. Unlike knits, bias cut woven garments follow the contours of the body in a subtle (never clingy) way. The garment moves and flows around the body. Such garments are a dream to wear. Our designer, Julianne Bramson, developed a love for the bias cut while studying Madeline Vionnet’s innovative bias cut garments. The bias cut is the act of placing the fabric on a 45 degree angle to the straight of grain, allowing the fabric to collapse and shape itself to the form underneath (the body). Many sewers shy away from bias cut garments because they can be tricky to sew. We try to design each pattern with most seams on the straight of grain even though the garment hangs on the bias. Look for the 45 degree angle seams. They are on the straight of grain of the fabric and are thus easier to sew. We have also simplified the garment construction process by numbering the notches with the sewing order. (For example, sew notch number one to notch number one first, then notch two to notch two, and so on.) The patterns may look a bit strange at first, but with fully illustrated directions and numbered notches, they are a snap to assemble. We researched and tested the best finishing techniques for bias cut garments and provide complete instructions for them. If you run into difficulty, we are only an email or phone call away! Bias garments are also very easy to fit as the collapse (stretch) of the open weave on the bias allows the garment to shape in where the body shapes in, and shape out where the body shapes out. The same dress can often be worn on three or four differently shaped women. 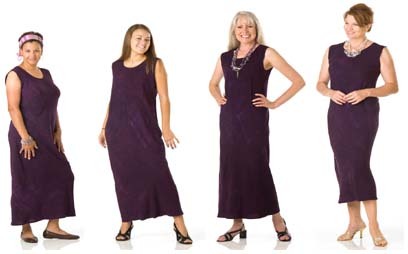 The photo below shows the EXACT same dress, being worn by four very differently shaped women. Like the "little black dress", Fashion in Harmony patterns will remain flattering and stylish for many years. When wanting to look especially glamorous, Hollywood starlets often reach back in time to when Madeline Vionnet was designing bias cut evening gowns in delicious silk satin. Time and time again bias cut garments are seen by famous fashion designers on the runways. Looking great is the best way to always be “in fashion”. The flexible fit in a bias garment also means you won’t have to worry if you gain or lose a little weight – your garment will still fit. Beginners as well as more experienced sewers will have fun with these patterns. So go ahead, grab some delicious fabric (yes! we carry fabric too) and make something you will love to wear!